The U.S. economy is facing head winds from many sources. These head winds include currency wars, trade wars, higher interest rates, tighter money supply and excessive debt. The results are appearing in a declining rate of GDP growth. U.S. annual GDP growth was 4.2% in the second quarter of 2018, 3.4% in the third quarter and is currently estimated at 2.8% for the fourth quarter, according to the Atlanta Fed. On the whole, this looks like a reversion to the slow 2.3% growth we’ve had since the recovery began in 2009. Increasingly, it appears the 2017 Trump tax cuts produced a temporary bump in GDP growth, but not the lasting return to trend growth (3.2%) expected by the Trump inner circle of Larry Kudlow, Art Laffer and other advisers. But, now the head winds have helped in the form of a self-imposed drag from the government shutdown. 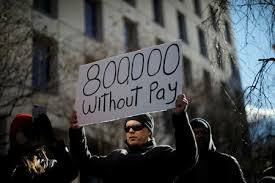 As described in this article, there are currently 800,000 government workers who are not getting paid due to the failure of Congress to pass the needed appropriations. These workers will receive back pay when the government reopens, but that may take weeks to accomplish. In the meantime, these workers will spend less, skip restaurants and other discretionary spending and draw down savings to cover mortgage payments and other necessities. By itself, this kind of reduced spending could cut 0.2% off GDP. Reduced government spending by the affected departments will reduce GDP even further. This is not a permanent or extreme condition, but it doesn’t help at a time when growth is already weaker. Get ready for higher unemployment, more disinflation and lower interest rates in the months ahead.